Signed and dated l.l. corner, black oil "R. Wakelin/ 58". Heather Johnson, Parallel visions: works from the Australian collection , 'Roy de Maistre / Roland Wakelin', pg. 48-59, Sydney, 2002, 58, 59 (colour illus. ), 146, 147. An expanded view: the Mary Turner Collection at Orange Regional Gallery , 'List of works', pg. 117-124, Orange, 2011, 123. S.H. 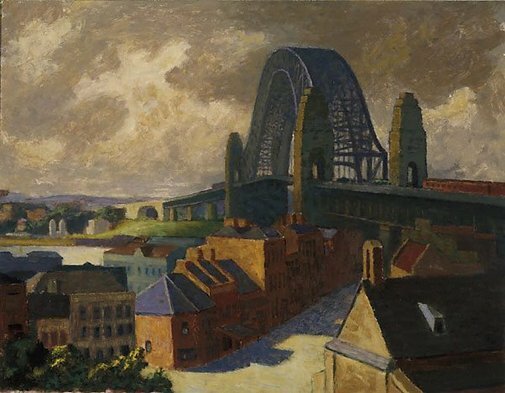 Ervin Gallery, Observing Sydney: views of and from Observatory Hill , Sydney, 1993, 8 (colour illus.). Gavin Wilson, Harbourlife , 'harbourlife', pg. 7-32, Sydney, 2007, 56, 8, 12 (colour illus. ).